What Is the Difference Between Full-Time and Part-Time Employees? Are your employees full-time or part-time? Or do you have some of each? And what is the line between full-time and part-time? Every business can set amounts for differentiating between part-time and full-time employees for purposes of pay and benefits. But if you want to set these differences in your company, you need to know the various laws that determine part-time and full-time status, and how these laws might affect your business. For example, you can set a specific number of hours a week as full-time for the purpose of giving health care benefits to employees. In many companies, full-time employees receive benefits while part-time employees do not. Another distinction between part-time and full-time employees is that they may be paid differently, salaried vs. hourly. Some full-time employees may be salaried while part-timers are paid on an hourly basis. Traditionally, 40 hours a week has been considered as "full-time" employment but there are many current instances in which the hours required to be considered full-time have been lowered. The Bureau of Labor Statistics defines full-time as 35 or more hours a week, but this is just for statistical purposes and is not a law. The Affordable Care Act (Obamacare) defines full-time employees as those working an average of 30 hours a week, for the purposes of defining employer required payments for larger employers. Many employers require fewer hours for full-time status, such as 35, 32, or even 30 hours. 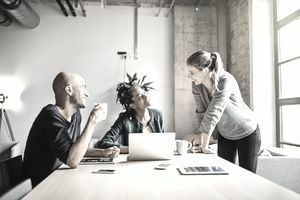 Susan Heathfield, writing about Human Resources for thebalance.com, notes that, "fewer hours is considered a non-standard benefit in some organizations." That is, it's a benefit to the employees to be able to work fewer hours and still receive the benefits given to full-time employees. "Whether an employee is considered full-time or part-time does not change the application of the FLSA." That is, employers must follow the provisions of the FLSA for both full-time and part-time employees in matters such as minimum wages, overtime, and child labor. As an employer, you have the right to designate what constitutes a full-time employee, as long as you consistently apply your own criteria to all employees. What's the Difference Between Full-time Employees and Full-time Equivalents? The Affordable Care Act requires employers to do a calculation for full-time equivalents, for counting purposes. This process takes part-time employees and calculates the percentage each part-timer works as compared to a full-time employee. This calculation doesn't affect the employees; it's just for counting purposes. A business that has 50 or more "full-time equivalents" faces a penalty if the employees aren't given an employer-paid health plan. A business that has fewer than 50 full-time equivalents may receive tax credits for providing a plan. A part-time employee is an employee who works less than full-time. While this sounds obvious, it's important to spell out this distinction in your employee policy manual. You can designate specific types of employees or specific types of jobs as part-time. For example, you may want to make all laborers part-time and all clerical employees full-time. You can pay part-time employees at hourly rates, and different rates for different types of work. But be careful not to discriminate by making some workers in similar jobs part-time (and denying them benefits), while others in the same job are full-time. Don't make all the women part-time and all the men full-time. Why Should I Designate "Full-Time" Employee Status? And part-time employees are often excluded from participation in employer retirement plans. As you can see, full-time employees are more expensive to hire than part-time employees. When you create your employee handbook or policies and procedures manual (with the help of your attorney, of course), specifically define which jobs are part-time and what benefits are available to full-time employees and which to part-timers. No matter what the status of an employee, you as the employer are required to withhold payroll taxes (income taxes and FICA taxes) from all employees, pay for unemployment taxes and worker's compensation benefits.